IoT Evolution | Don’t Worry Be Forecasts. Posted January 4th, 2018 by Carl Ford & filed under Uncategorized. I receive Business Insider’s IoT Briefing curated news in my email. They always have interesting headlines and sometimes I think they have a sense of humor. Peter Newman’s curation today had the irony of these warring charts. The first was talking about the Smart Home lock company Otto that has lost its funding and leaves a bunch of ex Apple employees scrambling for a paycheck. They tried to be Apple like with a 695 price tag for a door lock. Business Insider than provides this graph. Now mind you Otto had not come to market yet, and this graph lists price as the first roadblock. Clearly Otto was not looking at this information. 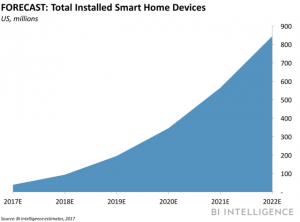 Now either in an attempt to save the smart home consumer device manufacturers from jumping off a cliff or to counteract this information, he then includes this graph. Now here is the problem I have with the forecast. I think based on the survey the forecast is optimistic. Mind you I now have an Echo, 1 Ring, a smart lock and 2 dots in my home. Most of the purchases have been based on word of mouth between my wife and her friends. The problem for Otto at their price point, the amount of word of mouth purchasing dwindles to a crowd that wants to be chic. 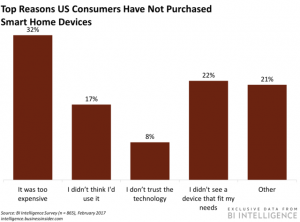 While AirBnB has made smart locks a great choice for a niche market it’s hard to convince someone that a simple mechanical device can be improved by adding intelligence. Like Otto if you get funding you can be happy looking at the forecast, but personally, I would worry about the obstacles for adoption.